Day of birth – happy and joyful holiday. It only happens once a year, so I want to make this day was for a birthday filled with pleasant and bright impressions. Event organization requires an individual approach, because the celebrant can not only be close to the man, but a friend or employee. Morning to your co-worker may begin suddenly, for example, musical greetings on the radio. Every day many radio stations hold special morning show, which is fun and all over the country congratulate the birthday. Take advantage of this option. Possible festive decorate your workplace colleagues. For example, before he came to work, put a greeting card, a souvenir or gift. Either on the desktop computer, install the birthday screensaver. If your company has a website, place on it your greeting. Place a photo of the birthday boy and write kind words. May guests or customers of the website will echo your congratulations. Such attention will impress your colleague. 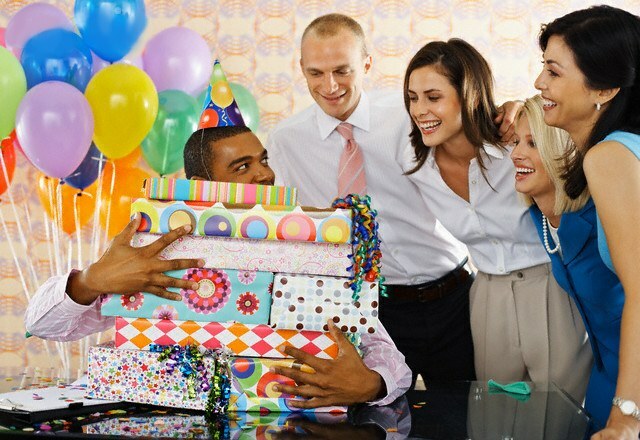 You can play your employee: to pretend that you forgot about his day of birth, and after the working day under any pretext to invite him to a café, where already in advance be prepared the surprise party. Such compliments will surely be original and enjoyable. To congratulate a colleague of the original humorous poem or a story. Try to write it all yourself or work team. The contents focus on the description of the positive traits of the birthday boy. Your employee will be especially nice if such a greeting will read the chief himself. Can also remember some interesting, funny story connected with the birthday boy. He will appreciate such a creative and original approach to his triumph. Give your colleague something memorable. Let this be a cheap gift, but it will waft to your colleague the memories of a fun party. For example, you can order a mug or t-shirt with "trick", funny drawing or photograph of the birthday boy. If your colleague is a fan of any actor, character or political figure, give him the statue of an idol. You can order a portrait or caricature and place it in a beautiful frame. These gifts can be as decoration in your home and workplace.